Had a “near constant presence in Washington” this spring, where he met with senior Clinton advisors such as Jane Harmann. 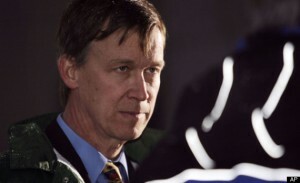 For those on the left who are impressed by Hickenlooper’s “aw shucks” persona, just understand that under that thin veneer is a regular old politician, willing to do almost anything to get that next gig, including exploiting one of the worst mass shootings in our nation’s history. « CAUGHT! Democrats Rigged the System for Hillary, Will Colorado Pay a Price?